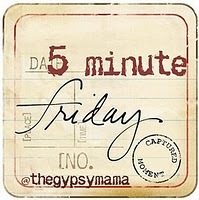 The Gypsy Mama has a cool feature on her blog. Every Friday she sets a topic, and anyone who wants can write a blog post inspired by that theme and link it back to her blog. There’s just one stipulation: you have to write for five minutes only and…not go back and revise or edit afterwards. That seems like a good exercise, so I thought I’d join in once in a while, and this is my first ‘while’. That challenge has never really meant anything to me. I’ve always been able to do more or less anything I turn my hand to. Sorry if that makes me sound smug, but it’s true. My problem is, doing something excellently. It was a wonderful gesture. But it was too late – I had set myself into a pattern where I didn’t even notice the boredom any more. What else was there to strive for – if I was getting all the answers right, what more could there be? There’s a theory going round at the moment that we can all achieve pretty much anything we want simply by working at it for 10,000 hours. I read recently about someone who’s learning golf to test this theory. He doesn’t have any natural golfing talent, but he’s working at it for 10,000 hours to see where he gets to. So the real question is, what do I care enough about to devote 10,000 hours to? If I knew the outcome would be amazing beyond my imaginings, what would I put in the time, effort and self-discipline to do? What would you? To read more 5-Minute Fridays, click here. what do I care enough about to devote 10,000 hours to? That truly is the question, where is the passion, the I can’t live without_____? Thanks ‘mom’! Let me know when you find your thing – though from your name and avatar, I’m guessing for the next few years at least you’re investing tens of thousands of hours into bringing up your kids. Don’t disregard the importance of that, you’re investing time and energy into their lives and those of their children and grandchildren. I’m sure you care enough to work at getting that right! I think you sell yourself short. Does anything or anyone suffer because of you do great not excellent? Does God ever nudge you and tell you that you need to put more into it? If I remember correctly, you got something like 5 A’s, 4 B’s and a C in your GSCE’s. Right? Has that ever held you back? Would anything great have come of your life thus far should you have gotten 10 A’s? I, on the other hand, strive for greatness and live with the constant disappointment of not being able to achieve it. Aww… thanks Pete. This last year I’ve been really wrestling with who I am, since I always thought I had the potential to excel, I just never tried (those GCSE grades are OK, but not great), then I decided to work hard at my MA and still did averagely. It’s been quite a shock to discover that underneath all this averageness, there’s just an average person waiting to come out! No, being average hasn’t held me back, I’ve had a great adventure and God has opened incredible doors (eg I have met and chatted to all 3 of the people in posh costumes running today’s wedding service! ), but I’m certainly not great at everything, just reasonably competent at it – as are you. What’s the point of striving for excellence? I guess I’ll have to think about that (expect a follow up post sometime soon! ), but don’t forget to turn that back on yourself, too – why keep striving for something you fear you’re not attaining? You’re successful, well-liked, respected and a great husband and father. If I’m not allowed to burden myself with a desire for more – neither are you!